Do you ever have those feelings, those little tremors of premonition that say, “This is going to be good”? Like the first time you heard that power chord hit on Ronnie James Dio’s Rainbow In The Dark. You knew Dio was going to slay it vocally, but then that power chord hits, those keys kick in, and it’s on. You know this is going to rock out loud. 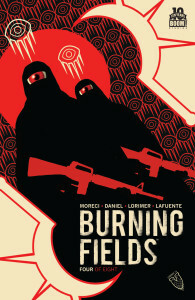 That’s the feeling I got when I read the first page of Burning Fields #4.